Flow sensors measure air and liquid flow speed. Flow sensors ma ke use of different measurement principles. Using the flow speed, analysis units of flow sensors can calculate the flow level or determine the amount of flow with a counter. Our flow sensor operation is based on ultrasound. A great advantage of this type of non-contact measuring is that we do not have to expose sensors to pressure surges or solid agents. Air flow sensors are mainly used in the heating, ventilation and conditioning sectors. Flow sensors use the manometric method which can be used for a wide range of temperature and flow. These flow sensors can be easily installed in ventilation ducts. If you have any question about flow sensors, contact us: +44 ( 0 ) 2380 98703 0 and our technical staff will be pleased to help you with flow sensors as well as with the rest of measuring instruments and scales. Within the field of industrial processes, it is sometimes necessary to determine the flow speed of both air and liquids with the help of flow sensors by using several measurement methods. For example, the easiest way to determine air flow speed is using an impeller and then the user can count the impeller revolutions. However, this measuring system has some disadvantages. For example impellers are very sensitive to mechanic loads. Besides, if there are suspended solids in the air, they can destroy the flow sensors. These flow sensors with impellers offer a high resistance and cause a pressure drop. 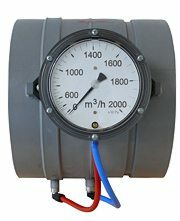 Other flow sensor models measure differential pressure between static and dynamic pressure calculating this way the current velocity of the medium. Other measurement methods cool the air which goes through flow sensors or even there are other models that use the ultrasound method. If you have any questions, contact us: +44 ( 0 ) 2380 98703 0.